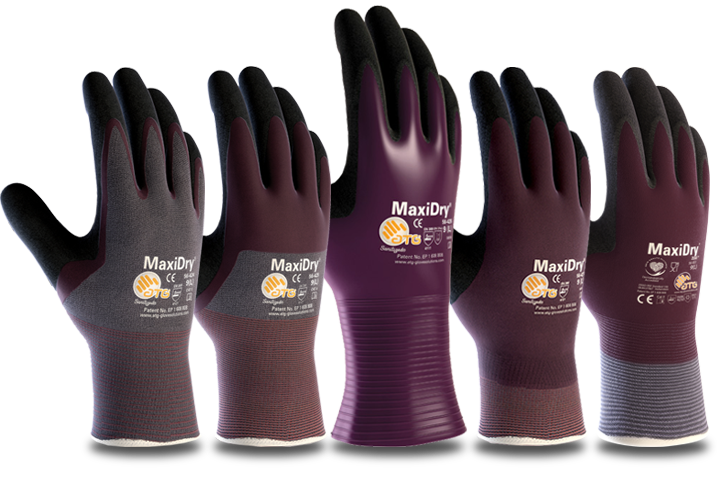 Inspired by ATG®, MaxiDry® Gloves are a lightweight and comfortable general-purpose grip glove for those requiring precision handling in difficult oily or wet conditions. Engineered for applications such as engine, power train, gear box, transmission, shock absorber assembly, handling small castings, components and parts, these MaxiDry® Gloves by PIP® feature a synthetic non-slip coating combined with an industry leading ultra-fine gauge seamless knit nylon/lycra liner that provides excellent comfort, sensitivity, fit and dexterity. ATG® innovations include LiquiTech® barrier technology to provide resistance to chemicals, oils, and liquids while GripTech® provides an intense and less fatiguing grip. This patented micro-foam nitrile coating offers 360° breathability and is compatible with oils, petrochemicals, fuels and most acids. The micro-cup finish is designed to channel away liquids to allow better handling. This nonslip grip has smooth edges and is only applied where it is actually needed - in the palm area - to ensure flexibility isn't compromised. To avoid chemicals resting against the skin, MaxiDry® gloves feature a straight cuff that can be turned out to create a reservoir for even better barrier protection. Located internally in the cuff region is an exclusive elasticated support that provides a “locking” effect that prevents slippage that result from working movement. For the ultimate in cleanliness, MaxiDry® Gloves are laundered prior to final packaging making it clean and safe for user and product. The Oeko-Tex® Association has evaluated and certified this product as skin safe and after scientific review, the Skin Health Alliance has awarded its’ professional dermatological accreditation. To prolong use, MaxiDry® Gloves can be laundered for re-use. Just remember to use commercial laundry soap or detergent (do NOT use dry cleaning solutions). Wash in warm to medium hot water, do not exceed 104°F (40° C) and wash for 10 minutes and rinse in cold water. Repeat cycle. Wash and rinse if soiling is especially heavy and tumble dry - maximum temperature 140°F (60° C). Contact MDS for volume discounts, to place an order or with product inquiries.